Families and friends may want to dress up for Halloween as a group. 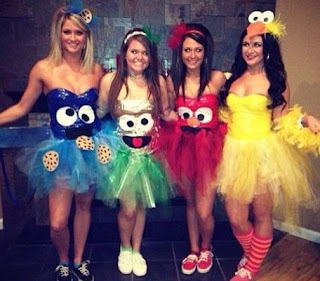 Popular costumes for groups include those that can be made from various colors, shapes, cartoons or hit movies. 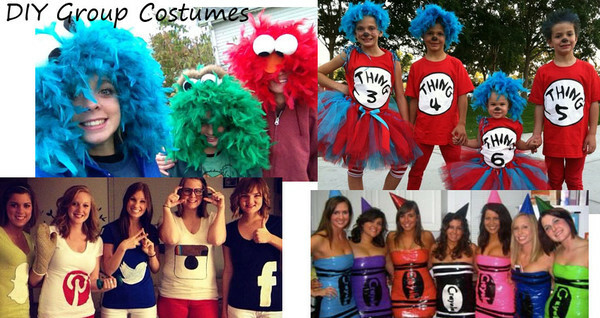 While the costumes look clever as a group, each homemade outfit will stand alone when family and friends leave. Each member can pick a color and dress as a crayon. A variety of colorful crayon costumes are available on Amazon.com for adults and children alike. Dressing as a crayon is perfect for school Halloween parties and parades. 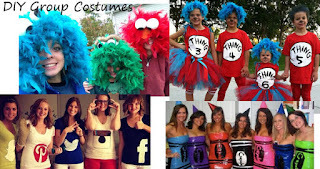 Browse the colorful costumes or visit How to make a Crayola crayon Halloween costume. t, Ernie, this group can be huge!Visit How to make a Cookie Monster costume for details on crafting your own outfit, or simply purchase the costumes online. Dr. Seuss and Thing 1 and 2 and so on ... costumes are perfect for school teachers, daycare / library workers and parents of small children. There are a variety of Dr. Seuss character costumes available on Amazon.com, or it's really simply to craft your own "Thing" costume. Visit How to make a Dr. Seuss Thing for detailed instructions. The sequel to the animated comedy hit movie, Despicable Me, as renewed the popularity of those pesky minions. Men, women and children in the group can dress as minions. Make your costume by visiting How to make a Despicable Me minion costume, or purchase them online. Along the same animated series line, still popular today are the characters from the cartoon series, the Flinstones: Betty, Bam Bam, Fred, Wilma. View the selection of Flinstones character costumes available here.